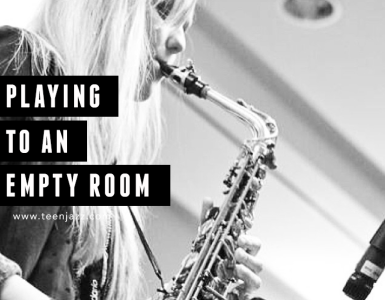 Today on Teen Jazz Radio I’m going to talk about when to say no to an opportunity that comes knocking at your door. It may be a gig, a recording session, a teaching opportunity, etc., but when you don’t have the time or if you aren’t the right fit (or even if it isn’t the right fit for you), it’s important to learn how and why to say “no” the right way. Also in this episode, I’m also going to feature the music of Yvonnick Prené, Vaclav Kozel, Reggie Padilla, Michael Paulo, Adam Larson, and Scott Martin. So, before we dive into today’s tips on how and why to say no, let’s check out our first music set. This week I’d like to introduce you to harmonica player Yvonnick Prené and Vaclav Kozel. The first song you’ll hear is Desafinado by Yvonnick Prené from Wonderful World and second I’m going to feature Jambo Live by Vaclav Kozel from Ja Vam dam Jazz. Once again, the first track was Yvonnick Prené with Desfinado. You can learn more about Yvonnick in our interview with him on Teen Jazz or at his website, yvonnickprene.com. And after that was Vaclav Kozel with Jambo Live. Ideally, we do music because we love it, we can’t always be selective with our gigs. When work is slow, we often have to take gigs we normally wouldn’t like to do to pay the bills and make ends meet. Sometimes we have to do gigs because we’re still paying our dues and need the experience. Even though this may be the case, there are instances where saying “no” to a gig might be the right thing to do (even if you need the money). What are some reasons for turning down a gig or a project? When the quality of the project or gig does not fit your “brand” as a musician. I’ve talked about branding in the past, but I’m going to just briefly summarize what I’m referring to in today’s podcast so that there isn’t any confusion and to save you some time looking it up later. 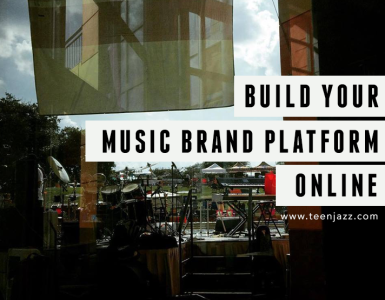 Your “brand” as a musician is your total package – your image (how you dress, how you present yourself, the colors and images you use on your website), your music (the genre, your particular style, the instrument you play), your personality (are you funny? outgoing? controversial? ), and so on. It is who you are as an artist. Your music, your look, and your packaging all need to fit this brand. It’s super important to be consistent. So when a gig comes along that may be outside of your branding, it’s probably best to say no. How might it be outside your brand? Quality. Now, there are two aspects to this point. One is whether or not the quality of the opportunity is a good fit for you. If you don’t have enough time to prepare because you’re already swamped with other projects or gigs, the quality of YOUR performance may not be as good as it needs to be. This affects your reputation and thus your brand as an artist. Don’t put out poor work because you don’t have time. In this instance, it’s probably best to say no. The same goes if you’re not at the level you need to be to do the opportunity. If it’s not too far of a reach, you can probably successfully meet the requirements of the opportunity, but if you’re normally a rock guitar player and you’ve been asked to do a fusion gig two weeks from now, you probably won’t have time to get to the level you need to in that genre to do the gig well. Say no. The same is true in reverse. If you’re playing or ability is of a much higher caliber than the opportunity, it might be a good decision to say no. Of course, take this with a grain of salt and be careful not to inflate your abilities or where you are a musician. It’s almost always good to be humble, but try not to put yourself in situations where you won’t sound good, it could come back to haunt you later. The wrong type of gig or project. I kind of mentioned this is the last point, but I’m going to further reiterate it. As a musician, even if we are versatile, we tend to have a focus and a style in which we are stronger. If an opportunity comes that is too far outside of your comfort zone or that doesn’t fall into your strengths as a musician, you might not want to accept the project. For example, if you’re a drummer who usually plays in the pop/country genres, you might not want to take an RNB or jazz gig. 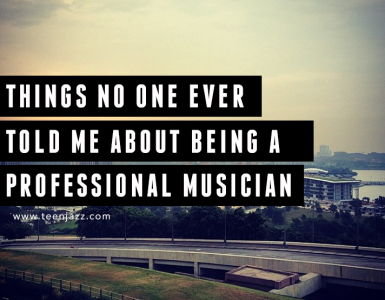 Or maybe you’re a soul-jazz singer, auditioning for a part in an opera or a musical might not be a wise choice. Our second set of music for today’s show is going to feature Reggie Padilla and Michael Paulo. The first song you’ll hear is Another Day by Reggie Padilla from They Come and They Go and second I’m going to feature Renaissance by Michael Paulo from My Heart & Soul . Once again, that was and before that was Reggie Padilla with Another Day and Michael Paulo with Renaissance. You can find more information about Reggie Padilla at reggiepadilla.com and Michael Paulo is at michaelpaulo.net. You don’t have the required skill set. This is kind of the same as above, but a little more specific. Perhaps you can’t read music and an opportunity comes up where you’re required to do just that. There’s likely no way you can learn to read music and in this case “faking it until you make it” is not something I’d suggest doing. The same goes for gigs that require you to double on instruments you can’t play, sing or perform in a completely different genre, sing background vocals if you’ve never done it before, or even do things like choreography if you’ve don’t have any past experience. Of course, there’s always a time to add skills to your arsenal, but if you don’t have time to develop them before you need them, if it’s something you’d eventually like to do, say no this time but work on it so you can say yes the next time. If there is too steep of a learning curve, you’re only setting yourself up for failure, so it’s best to turn down the opportunity. Ethics. Music is in the entertainment industry, so there may be opportunities that you aren’t comfortable with ethically that may come up. If an opportunity goes against what you believe, don’t be afraid to draw the line. If you allow yourself to get pressured into a gig or performance that you aren’t comfortable with, your feelings may subconsciously affect your work, so don’t be afraid to say no. It’s hard to do a good job if you’re miserable or uncomfortable and this may be something that could affect you for longer than the duration of the opportunity. The last reason to say no is the most obvious. If you’re already booked, and you’ve promised your time elsewhere, you should say no. Even if the new opportunity is better paying or a more interesting gig/session, it’s going to look worse to cancel your original commitment to do the new one than it will to say no. If you explain your situation to the second person, you may be able to reschedule, but they’ll understand you’re committed and won’t be worried about you flaking out on them the next time around (and the same goes for the person with whom you made the original commitment too). If an opportunity comes up that’s within one of the first three reasons to say no – quality (on your part), wrong type of project, or lack of skill set – there may be a a way of getting around having to say no. For example, let’s say the opportunity is a recording session and not a live performance with a scheduled date. See if you can negotiate more time before the recording takes place so you can work on the style or double required of you. Projects often have deadlines, so this may not be feasible, but if their schedule isn’t too strict, you may be able to get a little more time. If the reason you have to say no is because you’re already booked, see if they’re willing to let you subcontract one of your friends (who will do a good job – referring someone who can’t do a good job looks bad for both you and your friend) so that they know that when they can come to you in the future, if you can’t do something, you can help them find someone who can (and this alone may encourage them to check with you first). Another option may be to collaborate with other musicians. An example where this might work is a bit complicated, so I’ll try to sketch this out. Let’s say you love working in the studio – writing, arranging, and recording but you’re still unfamiliar with the mixing and mastering process. You have another musician who has heard your stuff and they ask if you’ll write and produce a track for them assuming that they’ll get a completed track by the end of the session. In this case, it makes sense to use some of the money that you’ve made (or will make) doing the project to have someone else come in and mix/master rather than try to buy the equipment and learn to do it yourself. Not only will it be better, but it will likely also be more affordable. On the other hand, if you begin getting more and more opportunities like this, it may make sense to invest in the needed equipment and learn that skill set (but after the initial project, there’s not enough time to do it in this particular case). Unfortunately, however, there’s not always a way to get around having to say no. When these cases come up, be as professional as you can when you refuse the opportunity. Honesty is the best policy. No not honest as in negative “Sorry, I can’t do your gig because you aren’t very good and I don’t want to play with you.” Be honest as in “I’m sorry, but I don’t think I would be the best fit for this gig.” If it’s sincerely something that isn’t the right choice for your brand, be sure to let them know otherwise they may come back and ask you again thinking you were just too busy for the original opportunity. If you know someone who may be right for the opportunity, pass it on. Which leads me to my second point. Build up a network of fellow musicians so that you can refer a trusted colleague to those with opportunities you aren’t available for or that you aren’t interested in doing. If you honestly aren’t available due to other gigs or time restraints, let them know, they may come back to you with the same opportunity or new opportunities when your schedule frees up. For example, if you’re traveling on tour, let them know when you expect to be back. They may call you for something during that time. If you don’t share your schedule with them, they may not call you for another opportunity because they aren’t sure where you are or what you’re doing. Last, be polite yet firm. Don’t be overly apologetic once you’ve made up your mind, but don’t be rude if the other person is persistent. If you don’t stick to your decision, it’ll make it sound like you’re uncertain and the other person could get pushy. This sets you up for feeling guilty – which you shouldn’t. If you don’t feel the opportunity is a good fit for you or you aren’t comfortable with it, there’s no reason to feel guilty because you’ve made the right choice saying no. It’s perfectly acceptable to set boundaries regarding what you can and can’t do, you’re availability, how much work you can handle and what kind of work you’re willing to do. Have you ever had to turn down an opportunity? How did you do it? If you didn’t turn down an opportunity that you should have, how did you feel afterwards? We’d love to hear from you. Please visit us at TeenJazz.com and join the conversation in the comments for the transcription of today’s podcast. Our last set of music for today’s show is going to feature Adam Larson and Scott Martin. The first song you’ll hear is This as Well by Adam Larson from the album Overdue Ovation and second I’m going to feature Quarter Moon by Scott Martin from Menudo & Gritz . Once again, that was Scott Martin with Quarter Moon and before that was Adam Larson with This as Well. You can find more information about Scott Martin at scottmartinjazz.com and Adam Larson is at adamlarsonjazz.com.